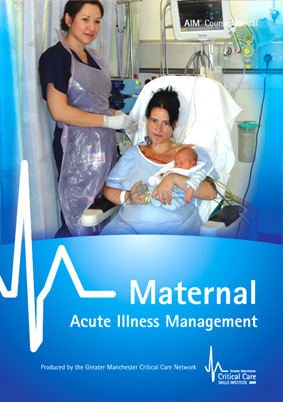 The Maternal AIM course has been developed following the most recent Confidential Enquiry in to Maternal Death (CMACE, 2011). The report outlined key priorities related to managing acute illness in this patient group which included identifying and managing deteriortaing illness. The day is a blend of lectures, workshops and simulated learning which embeds the ABCDE approach to assessment and management of maternal women who have deteriorating illness. Prior to the course candidates are provided with a comprehensive manual which provides underpinig knowledge to support the day and ongoing learning. The course prepares candidates to undertake at the end of the day an MCQ and simulated scenario assessment. Courses are free for staff working in Greater Manchester hospitals and carry a small charge for those working in other areas.